Paired with a compatible IntelliSkin® protective sleeve, the GDS® Locking Vehicle Dock secures and charges a wide variety of Apple, LG and Samsung tablets in any work vehicle. Newly available for the Apple iPad Pro 10.5 and the Samsung Galaxy Tab Active2, this dual spring-loaded, quick release cradle features a keyed lock for added protection. The integrated GDS® Technology™ platform enables charging capabilities to your mounted tablet wrapped in an IntelliSkin® sleeve. Without any need to remove the IntelliSkin® sleeve, quickly mount and remove your device from the dock. GDS® Technology™ solutions are perfect for commercial fleets looking to comply with the ELD mandate, as well as work trucks, forklifts and agriculture vehicles. 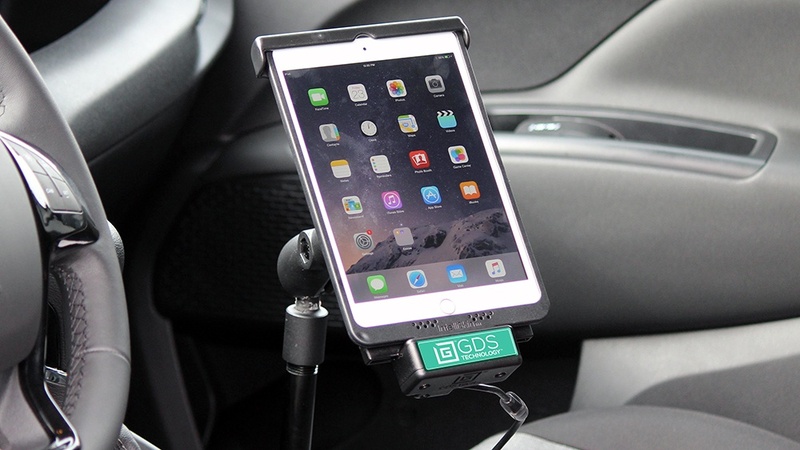 By utilizing GDS® Technology™, these vehicle docks charge any tablet wrapped in an IntelliSkin® sleeve. The quick release cradle makes it easy to mount and remove your device from the dock. When the time comes to inevitably upgrade devices, the IntelliSkin® and GDS® Technology™ ecosystem standardizes your charging connector so you can always use the latest technology. Upgrading devices is simple and cost effective – the interchangeable end cups are easily replaced. Right now for all these devices. Learn more about IntelliSkin® with GDS® Technology™.